Today’s Mac computers are amazing. They’re sleek, slim, extremely powerful, and filled with features like iCloud, AirPlay mirroring, Notification Center, and so on. So why are old Macs holding more value now than ever before, and does it make more sense to buy a new machine or a used one if the cost difference between them is negligible? These are the questions that I’ve been asking myself for the last few days, and I think there are a number of possible answers. I think that the most logical answer is that you just don’t get as much bang for your buck on a new machine as you used to. So let me take you back in time for a bit as we examine this theory. Back in the Summer of 2001, I set out to buy a new(er) Mac. 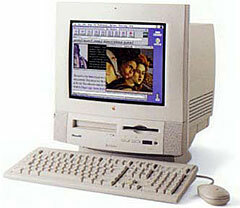 Back then I was using an old Performa 5400 that I had picked up about three years earlier for around $700 used. It had a pedestrian 120 MHz PowerPC 603e processor, 24 MB of RAM, and a whopping 1.6 GB hard drive. It was an good little machine, and the TV card in it was really coool. But it was now 2001. The 5400 was pokey running Mac OS 8.6, downright unbearable running Mac OS 9, and would never run Mac OS X. It was time for a newer machine. When I went out and started looking at new Macs, I was amazed at how much more responsive they all were – blindingly fast wouldn’t have described the difference. However, I was on a budget, and a new Power Mac G4 tower with a 15” LCD Cinema Display was way more than I could afford. I ended up finding a really nice deal: a Late 1999 Lime iMac DV with 128 MB RAM, a 10 GB hard drive, and, best of all, a DVD drive! I always liked the small footprint and lack of cable clutter that the all-in-one designs offered, so I settled on the little used iMac for only $600, less than I paid for the Performa just three years earlier! When I got the new iMac home, I was blown away. It absolutely screamed compared to the old Performa. It made my DSL internet connection fast and my MP3 encodes fast, it played QuickTime videos without a hiccup even at full screen size (something the Performa struggled to do in a window), and I could even run the iTunes visualizer (something I attempted once on the Performa, but at 1 FPS it wasn’t worth doing). I was in heaven: The iMac was a huge step forward from my old Performa. That iMac G3 was a loyal friend and a real workhorse of a machine for a very long time. Over the five years that I used it as my primary setup, I upgraded the RAM from 128 MB to 512 MB, replaced the stock 10 GB hard drive with a 120 GB hard drive, and went from Mac OS 9 to every version of Mac OS X from version 10.1 through 10.4.11 Tiger. After five years, the iMac that I loved was starting to feel slow. The interface of Mac OS X was very demanding on the G3 processor in my little iMac, and because most of the graphics in Tiger were driven by Quartz Extreme and Core Image (two technologies that the ATI Rage 128 in my iMac didn’t support), the entire interface had to be driven by the G3 chip without any help from the Rage 128 graphics processor. This made things like Exposé and Dashboard very choppy and ugly. Add to that the fact that I had developed an interest in encoding video in iMovie (a process that was almost intolerably slow on the G3 chip at 640 x 480 resolution), so it was time to look into a new machine. This time when I went out and started looking for a new machine, the Intel changeover was in its infancy, and I was really excited about what was available on the market. The new Core 2 Duo Macs had just been introduced, and the old Core Duo models were available on close-out pricing. It was a tossup between a refurb 17” 1.9 GHz iMac G5 and a close-out 17” 1.83 GHz Core Duo iMac. The G5 was $949; the Intel was $999. To me, this was a no-brainer: I opted for the Intel model, as it was twice as fast for only $50 more. The first thing I noticed when I set up the new iMac in my house was the glorious 17” LCD display. It was tack sharp, incredibly vivid, and had so much more real estate than my old iMac (1440 x 900 pixels vs. 800 x 600). The speed difference didn’t seem as dramatic as it had been going from the Performa to the iMac G3, but it was still there. The biggest difference I noticed in the interface was that everything was totally fluid. When I started using iMovie, that is where the big difference in performance made itself clear. I was able to encode and render video at 640 x 480 resolution in real time! Talk about awesome! The Intel iMac has been a wonderful machine to own for the past 6-1/2 years. I’ve upgraded the RAM to 2 GB, swapped out the old 160 GB hard drive for a 1 TB drive, and upgraded all the way to OS X 10.6 Snow Leopard and iLife 11. This machine really was the best machine I had ever owned. The only thing it wasn’t able to do for me recently was run Final Cut Pro X (I know some people don’t like it, but I was curious), or run any version of OS X newer than Snow Leopard. Now I could understand the former – I mean seriously, it is a 7-year-old machine. I can’t expect it to run the latest high-end video editing software. But not being able to run an up-to-date OS seemed a bit silly to me. After all, my old iMac G3 that I purchased used when it was 2-years-old was still getting the latest software when I replaced it five years into owning it, so why was my Intel iMac left behind after only five years? When OS X 10.7 Lion launched in the Summer of 2011, my Intel iMac was at the beginning of the end of being supported. At first I didn’t really think about it, because it was still working perfectly fine, and amazingly enough it didn’t seem to be suffering from lack of processor power as my previous primary computers had in the past. But I knew that if I wanted to continue using the sync services that iCloud offered and start using Final Cut Pro X, I’d have to start looking for a newer machine. I started looking at new iMacs just after the new Late 2012 iMacs were introduced. At first glance, I was impressed. The new units were incredibly thin and light, have incredibly powerful processors across the board, 8 GB RAM standard, 1 TB hard drive, and wireless keyboard and mouse, not to mention the glorious displays. They seemed to be really impressive machines – until I looked a little closer. Initially I was looking at the 21.5” iMac, but when I looked closer I realized that the unit doesn’t have an internal optical drive. This wasn’t a big deal – after all I, couldn’t even remember the last time I used a CD or DVD in my computer. Then I looked even closer, and I was shocked. RAM is not user upgradable without major surgery, nor is the internal hard drive. I couldn’t believe that Apple would release a desktop computer that doesn’t even have expandable memory, and releasing a desktop machine with a 5400 RPM drive in this day and age is not acceptable either. I decided to look at what was available on the refurbished store, and I found that I could get a previous generation 21.5” iMac with a 2.7 GHz Quad Core i5 processor, 4 GB RAM, 1 TB hard drive, and a free upgrade to OS X 10.8 Mountain Lion for $1,299. That is what I ended up getting. This new (refurb) iMac that I just recently purchased is a nice machine: The display is amazing (I love sitting in front of 1920 x 1080), but I can’t help but notice that when it comes to everyday tasks, it isn’t all that much faster than my 7-year-old Core Duo iMac was. When it comes to the new features of Mountain Lion as compared to Snow Leopard, let’s just say that I feel like adding an iPhone-like home screen as an option, removing the hard drive icon, and having the Finder list All My Files (literally) by default are not adding features – if anything, they are removing them. I really didn’t like having to search for ways to make the system act the way it is supposed to. I do have to give credit where credit is due though. I like Final Cut Pro X (although I understand why some people don’t like it), and my new iMac does render video about four times faster than my old Core Duo iMac did. It seems to me that either Apple hasn’t been been able to tax the CPUs with new OS features on machines made in the last seven years, or they simply haven’t been trying to. Either way, it would appear that they are doing everything they can to get people to upgrade to newer machines by simply blocking OS updates on older ones that are perfectly capable of running new software. Now for the big question: Should you buy a new machine or a used one? If you want Apple to support you for as long as possible, you should buy a new machine as soon as it is introduced. If you’re new to the platform and you want Apple’s support, you should get a new machine for the same reason. If you have an older Intel Mac but need some extra horsepower for heavier lifting, I’d say think twice before buying a brand new machine, maybe instead look at a Mac newer than the one you have. If you have an older Intel Mac and you’re doing general everyday tasks (browsing the web, email, word processing, spreadsheets, watching YouTube videos, watching Netflix, organizing your photos and music, playing with GarageBand, etc. ), don’t even bother with a new(er) machine right now. You’ll get a much bigger boost in performance by upgrading your internal hard drive to the Solid State variety and maxing out your RAM.